HAS veya gone under yet ??? ANYBODY seen him over the last day or two.. 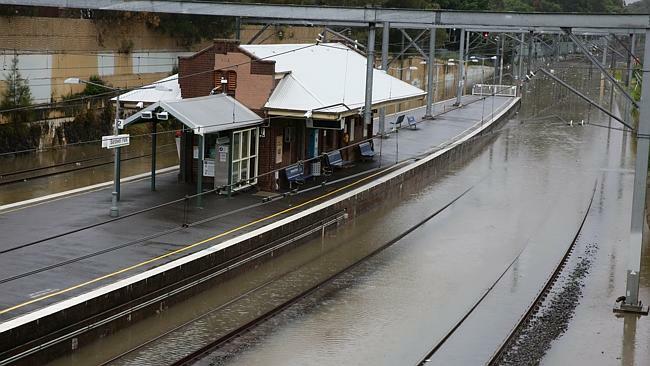 THE Hunter and Central Coast regions of NSW have been lashed by storms for much of this weak; with the tail end of the flooding rains hitting northern and southern parts of the Sydney Basin a couple of days later.. SOME Sydney-centric media sources are trying to label this as the "Sydney Storm" of 2015, but don't believe it folks ! THE proper designation should be the 'Dungog' (or Dungog-Maitland..) Floods, or even the Lower Hunter floods ~ NO WAY should the Sydney mafia be allowed to steal 'our' storm, when they only copped the tail-end ! Sydney's a good 2->3 hours drive South of the storm centre ! Wow! 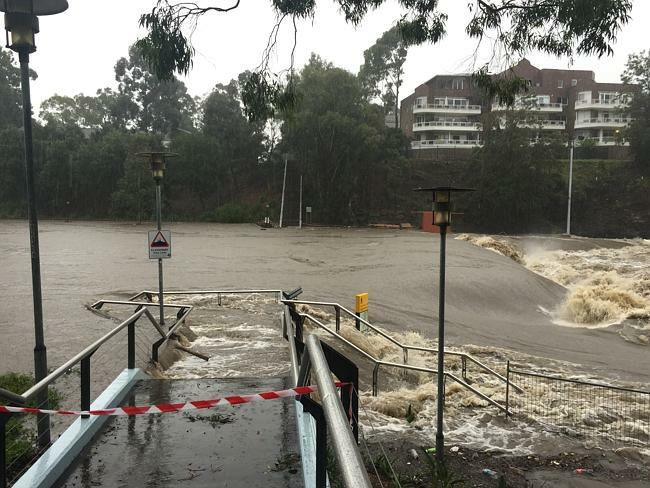 Lake Mac is being hit hard. We've got the exact opposite problem. it seem to just be 2 large storm cells meeting on the coast. HAVE a look at the weather map for Tuesday above, and by the rainfall you can see where the two storms were centred over Dungog and Southern Lake Macquarie..
THAT photo' of the Parramatta River is what the creek here looked like back in 2007 and earlier in 1974 ! OVER 60% of the damage reported so far has been in the Lower Hunter Valley and on the Central Coast..
OF the 7 people reported dead so far, there have been 3 in Dungog, 2 in Singleton, 1 outside Maitland at Gillieston Heights, and 1 at Gosford ~ none (yet) south of the Hawkesbury. AREAS south of the Georges River have seen bugger all, compared with around here ~ only need to look at the weather maps ! Or you could stop being in denial and actually read the scientific evidence you fear so much. What happens to your Bees Wolfie>? They were high and dry at the time; and far enough away from the actual flood areas.. Interested, if the flowers are under water can they be fed on sugared water? If there is a dearth of flowers for the bees, then they can be fed on sugar syrup for up to several weeks, maybe a couple of months -- as a substitute for the nectar..
After the first couple of weeks, they will also need a source of protein (normally found in the pollen that they collect from flowers..) for feeding bee larvae and for nurse bees to produce Royal Jelly.. Pollen supplements are available, using the likes of soy "flour" and powdered milk to provide the protein, but for longer use collected/stored pollen needs to be added to make an effective pollen "substitute". However, as in most of these nutritional matters, "natural is always better" over the long term.. Protein from pollen is fed to developing larvae, as well as carboydrates from nectar (Honey is the result of processing nectar by bees (via removing moisture and adding enzymes..) to allow 'surplus' honey to be stored within the hive for leaner periods..) -- the conditions under which the larvae are fed contributes totally to the bees body protein levels (as worker bees only feed on nectar once they have hatched out..). Poor conditions will mean both lower populations in hives, and shorter-lived bees over subsequent generations. The main flowering plants that might go underwater from this perspective could be things like pasture spp. like clovers and lucerne/alfalfa, and flowering crops the likes like canola, mustard, turnips, buckwheat (grain crops such as wheat, barley, oats, maize, aren't dependent on honeybees for pollination..). (Out on floodplains where clover, alfalfa, canola and such might be grown as irrigated crops, hives might be drowned or carried away at the same time if situated low enough, but I've never had hives in such situations myself..). Most of the time around here, there may be other floral sources up on higher ground and hillsides to tide bees over. In some places, some trees that don't mind 'wet feet' -- such as River Red Gums, melaleucas, mangroves, tea trees, Swamp Mahogany -- can keep on flowering while floodwaters are lapping their trunks -- so as long as the hives are sitting up on higher ground, they might still be able to work some such species.. Thanks for the info, always been interested in Bees, since stung on the arse while having a dump !